Pre-tied necktie with an American flag print. One size fits all. Perfect for election years, 4th of July, and other patriotic holidays. 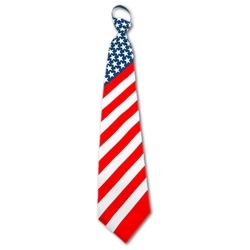 Pair this necktie up with our other patriotic or red, white, and blue themed costumes and costume accessories for a patriotic look!